Pennsylvania workers' compensation attorneys handling knee injury cases should be familiar with the anatomy of the knee and the most common knee injuries. The knee joint is the largest and most commonly injured joint. The three bones that comprise the knee joint include the thigh bone, or femur, shin bone, or tibia, and the kneecap, or patella. The bottom front of the thigh bone, top front of the shin bone and the back of the kneecap are covered with articular cartilage, a substance that allows your kneecap to slide easily in the patellar groove during movement. There are also the lateral meniscuses (toward the outside of the knee joint) and the medial meniscus (toward the inside of the joint), two tough wedge-shaped pieces of cartilage that act as shock absorbers between your thigh bone and shin bone. The knee joint is held together by ligaments. Collateral ligaments are on the sides of your knee and the medial collateral ligament is on the inside. We also have cruciate ligaments which form an “X” with the anterior cruciate ligament in the front and the posterior cruciate ligament in the back. These tendons are connected to muscles, including the quadriceps, which connects to the thigh. Stretching from the kneecap to the shin bone is the patellar tendon. The knee can be fractured, particularly on the kneecap. Dislocations occur when one or more of the bones are out of place. Ligaments can also be injured, particularly the anterior cruciate ligament, commonly injured while rapidly changing direction or landing incorrectly after jumping. The posterior cruciate ligament is ordinarily injured from a blow to the front of the knee while the knee is bent. This can occur in motor vehicle crashes but also in sports-related contact such as a tackle. The collateral ligaments are injured by having the knee forced to the side, most often resulting from a direct blow to the outside of the knee. Meniscus tears also often occur during pivoting or twisting. Tears to the quadriceps or patellar tendons occur less frequently, but are more common among the middle-aged people. Osteoarthritis is the most common problem in the knee, which results when cartilage gradually wears away. Acute injuries to the knee can accelerate or aggravate osteoarthritis. Chondromalacia, a disorder of the cartilage beneath the kneecap, is discussed in more detail here. If you need a Pennsylvania workers’ comp knee injury lawyer, it is best to hire an attorney with at least twenty years of experience. If you are considering hiring a firm other than The Boles Firm, use a copy of this page to question the lawyer about basic anatomy and the cause of knee injuries. If the lawyer cannot answer basic questions, seek someone else. 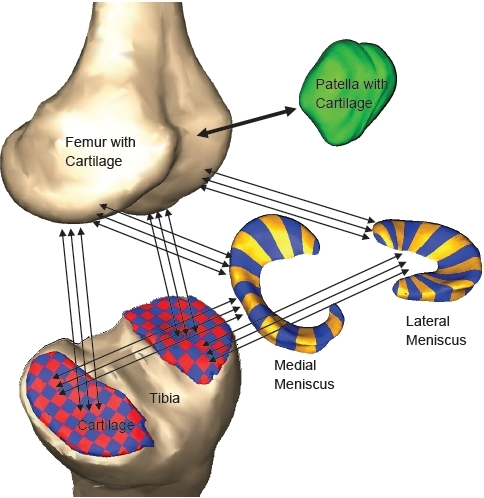 The images are reproduced from Guess, TM and Stylianou, A, "Simulation of anterior cruciate ligament deficiency in a Musculoskeletal model with anatomical knees," and Houghton, KM, "Review for the generalist of anterior knee pain." The images are used with the permission of Creative Commons.